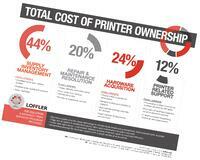 Do You Know Your Real Printing Costs? Managing hard copy print devices such as printers, scanners, copiers and fax machines can make a significant improvement to a business' workflow and cost reduction. A detailed analysis and study of your print environment can create a right-sizing plan that determines the ideal number and type of devices and the optimum locations, which increases and improves workflow and can cut costs by up to 30%. Over 40% of IT help desk calls are printer related. Using IT professionals to respond to printer issues takes them away from supporting more mission critical projects. Specially trained technicians that respond promptly and keep businesses functioning at a highly productive level makes much more sense. Printer Security is essential today. Recent research shows that 90% of enterprises say they have suffered at least one data loss through unsecured printing, which can cause sky-high costs and loss of client confidence. Organizations take steps protecting data on networks, computers and servers, yet overlook the network printer. The risk is real, as hackers have used vulnerable printers to send messages to a variety of organizations. 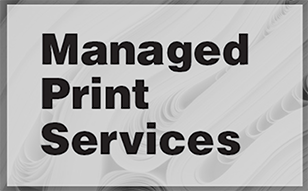 Managed Print Services (MPS), a unified approach to the management of hard copy print devices such as printers, scanners, copiers, and fax machines, can cut costs and improve businesses processes and efficiencies. An MPS plan can also include secure printing and scanning using PIN code access for authenticating users or HID badges, which also allows for single sign on to other company devices in different locations, branches or campuses. Additional assets gained through secure print include mobile printing, and print and copy accounting which allows for departmental chargeback, tracking and reporting. JT is Loffler's Director of Managed Print Services and the resident baker; he treats everyone to his home-made goodies on Fridays! Is MPS Right for You?